As part of practical conservation treatment and assessment subjects, students would like to share their work. There is a wide variety of approaches and artefacts being worked on. The GCCMC had the opportunity to assess the condition of an Achenese rapa’i drum from the Music Archive at Monash University (MAMU), and to recommend how best to care for it. This project was an interesting opportunity to design an appropriate treatment that considers both the physical and intangible properties of a world culture musical instrument. 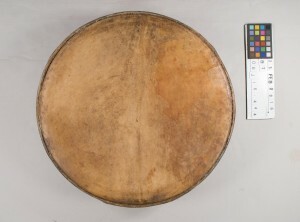 A large frame drum, 42cm in diameter and 10cm high, with a frame is made from a slice of hollowed out tree trunk, and is covered with a skin drumhead. Rapa’i drum frames are traditionally made from the wood of the jackfruit tree (Kartomi 2012), although it was not possible to confirm if this was the case, and the dark wood has a glossy coating. The drumhead is possibly rawhide as it does not appear to have been treated, and the grain is consistent with goat hide, a frequently used material for rapa’i (Kartomi 2012). A single hole in the side of the frame contains a pin securing two metal jingles and an loop of plastic cord, likely to have been used for hanging the drum when not in use. Inside the frame is a loop of rattan, known as a ratoh, which is used for tensioning the drumhead prior to playing (Kartomi 2012). The drumhead is slack and appears to have lost some of its flexibility. Adhesive securing the rawhide to the edge of the frame has cracked and sheared away. The varnish on the frame is slightly powdery and shows signs of separating. The metal jingles are slightly rusty. Is handling and treatment of this object by a female, non-Achenese/Muslim conservator appropriate and acceptable? Can the drumhead be adequately re-tensioned and tuned according to the musician/maker’s original standards and intent (Odell and Karp 2005)? Should the drum be re-tensioned if it is not going to be played? 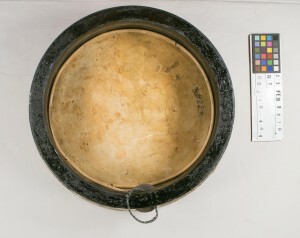 Drum after treatment, without insert (left) and with insert (right). Appelbaum, B 2007, Conservation Methodology, Butterworth-Heinemann, Oxford. Ashley-Smith, J (ed) 1987, Science for conservators Vol 2: Cleaning, The Conservation Unit Museums and Galleries Commission, London. Barclay, RL 2005, ‘General care of musical instrument collections’, in Barclay, R, ed. The care of historic musical instruments, CIMCIM, electronic edition, <http://network.icom.museum/cimcim/resources/the-care-of-historic-musical-instruments-full-text/>, accessed 30 March 2016. Barclay, RL and Hellwig, F 2005, ‘Materials’, in Barclay, R, ed. The care of historic musical instruments, CIMCIM, electronic edition, <http://network.icom.museum/cimcim/resources/the-care-of-historic-musical-instruments-full-text/>, accessed 30 March 2016. Barclay, RL and Karp, C 2005, ‘Basic conservation treatments’, in Barclay, R, ed. The care of historic musical instruments, CIMCIM, electronic edition, <http://network.icom.museum/cimcim/resources/the-care-of-historic-musical-instruments-full-text/>, accessed 30 March 2016. Cassar, M and Barclay, RL 2005, ‘Instruments in their environment’, in Barclay, R, ed. The care of historic musical instruments, CIMCIM, electronic edition, <http://network.icom.museum/cimcim/resources/the-care-of-historic-musical-instruments-full-text/>, accessed 30 March 2016. Kartomi, M 2012, Musical journeys in Sumatra, University of Illinois Press, Urbana, Chicago and Springfield. Odell, JS and Karp, C 2005, ‘Ethics and the use of instruments’, in Barclay, R, ed. The care of historic musical instruments, CIMCIM, electronic edition, <http://network.icom.museum/cimcim/resources/the-care-of-historic-musical-instruments-full-text/>, accessed 30 March 2016. Rivers, S and Umney, N 2003, Conservation of furniture, Butterworth‐Heinemann, Oxford. Smith, HS 1997, Aceh art and culture, Oxford University Press, Kuala Lumpur.